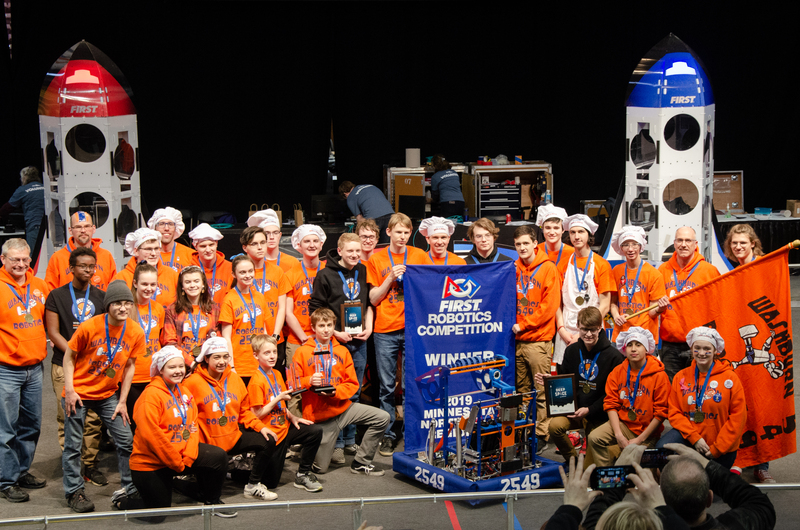 The Washburn Millerbots robotics team won the North Star Regional robotics tournament March 27-30, 2019, and for the second consecutive year will compete in the FIRST Robotics World Championships in Detroit, Michigan April 23-27, 2019. The team formed an alliance with Edina ("The Green Machine") and Minnetonka ("Chicken Bot Pie") to win the competition. The three-team alliance will compete together in the international competition in Detroit. The Washburn MillerBot team also won the "Industrial Design Award", sponsored by General Motors. The award "celebrates form and function in an efficiently designed machine that effectively addresses the game challenge." Congratulations to the team, captains Olivia Donney & Grant Ober, and coaches Dan Hollar, Ben Guengerich, Mike Schroeder, & Peter Grul!